Looks great, Sean. It is taking shape really nicely. Leave everything as open as you can, Pete. It would be a pity to cover up all those awesome details. Had lost my work area for a few weeks due to to renovations....bain action tonight! Will get to make some progress on my RG-31. Still waiting on the Panda Jerrv, seems to continuously be pushed back... we might have to extend the campaign to take into account the delay in the release lol..
Beginning to take shape, Sean. Wow Sean, it looks fantastic. I really like the RGs. On the home streatch now. 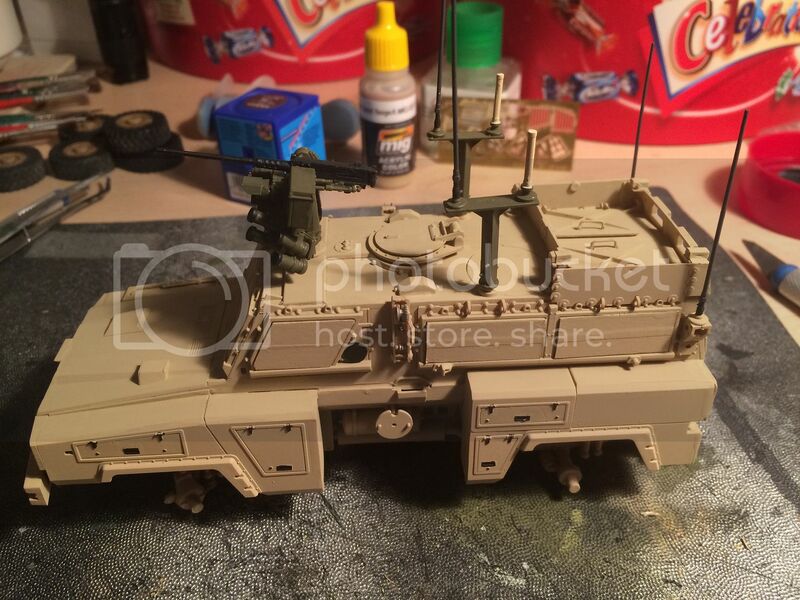 Quite pleased with the subtle weathering....not my normal OTT effort. Unfortunatly I did make one major error in spraying satin clear without sealing the rear doorway so the back window is a bit fogged on the inside. I'll have to make new glass for the two rear-most windows. The PG grills are going on over the lights very nicely but will need to tip-up the paint work on them. 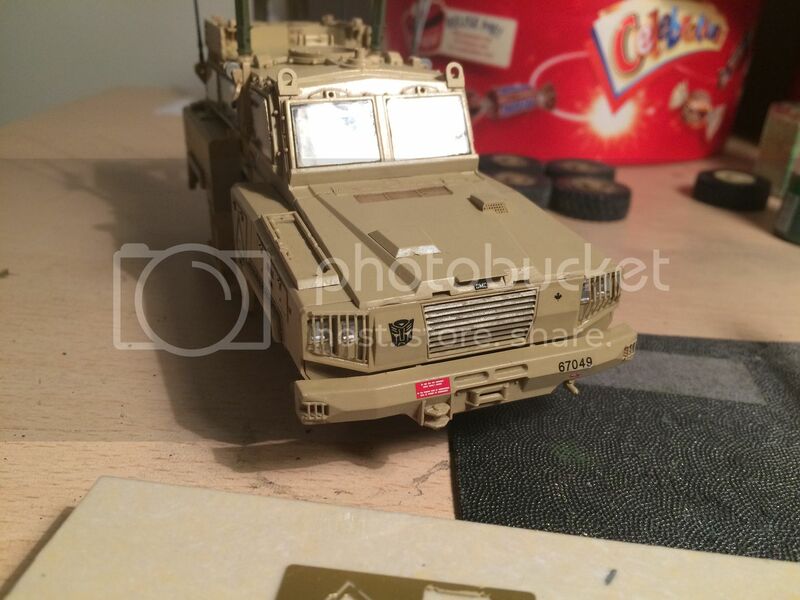 Just the tools, mirrors and some jerry-cans to be added and we're done. That should take 1 or 2 evenings but knowing me I'll still be "fixing" bits next weekend. Looking good, Sean! Almost there. Great Sean! Do you weathering it? Yes Andre, I am weathering it, but not very heavily. Wheels, underside and a bit along the sides done. The front bumper, grill and bonnet/hood are too clean though....will do a little bit more on them tonight. Great!!! I'm trying to return to my RG-31. Thanks for watching and commenting. I'll get some better photos into the gallery in next few days. Looks good, Sean. Very nice build with cool details. Thanks Jesper thanks for a campaign in my favorite genre! I've finished my entry for this campaign but as I just started thought I'd share it here.... 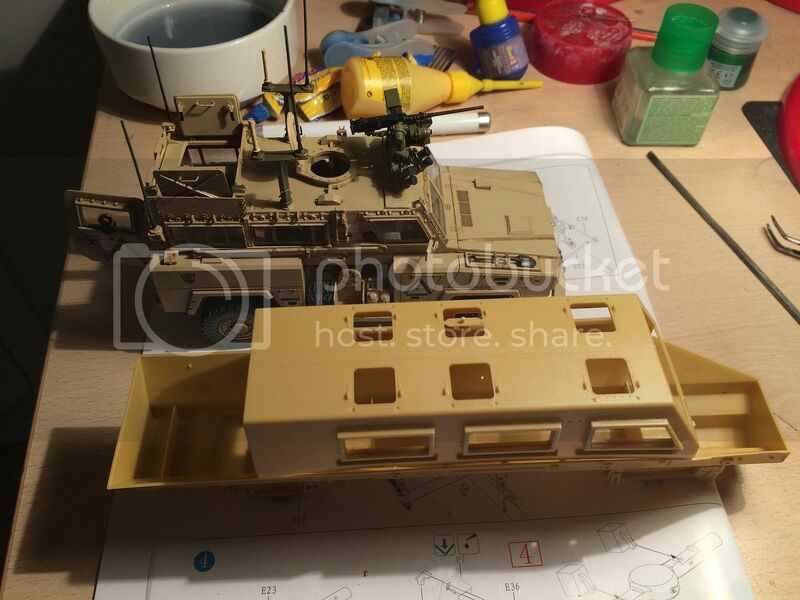 This is the 1/35 Buffalo by Bronco with Slat or Bar armour, the 2nd of 3 versions of this vehicle they have done. 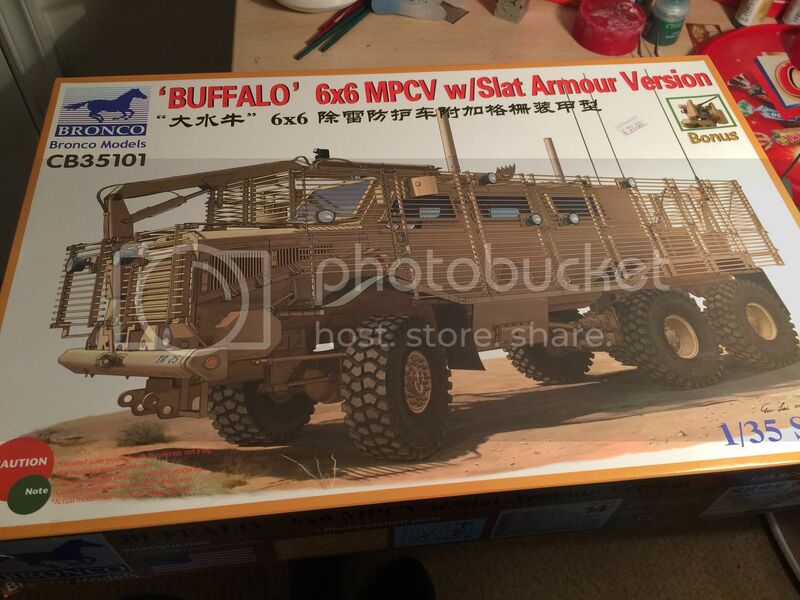 From WikipediaThe Buffalo vehicle was designed based on the successful South African Casspir mine-protected vehicle. While the Casspir is a four wheeled vehicle, the Buffalo has six wheels. Buffalo is also fitted with a large articulated arm, used for ordnance disposal. 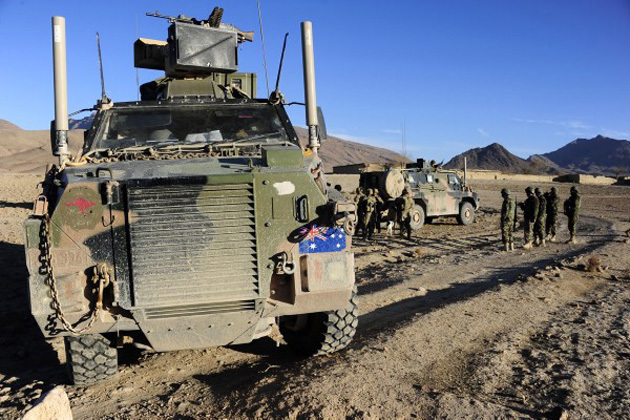 Both vehicles incorporate a "V" shaped monohull chassis that directs the force of the blast away from the occupants. 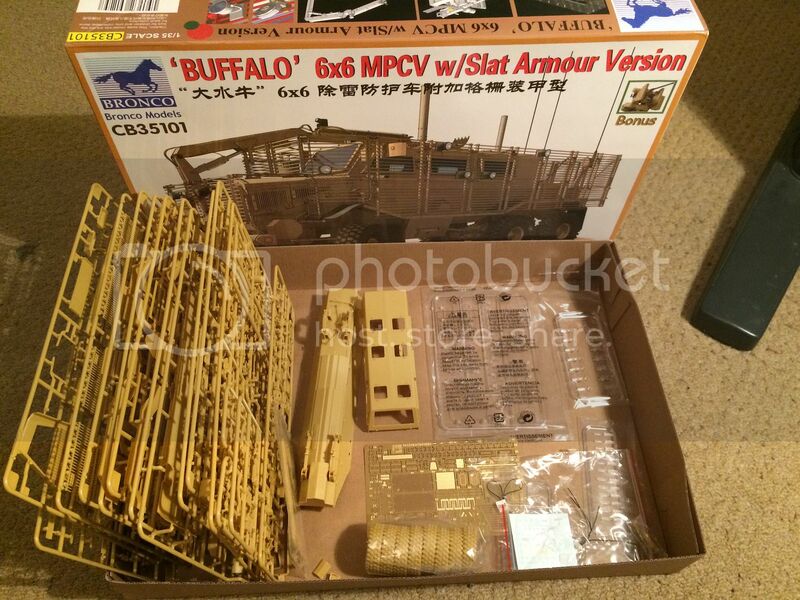 Inside the box are 13 tan sprues, 4 clear sprues, a large PE fret, 8 wheels, 2 halves of the hull and decals and twine for cables etc. It's also a very big vehicle. A lot longer than the RG-31 and that's not counting the arm! Started on the suspension. This will be a very slow build as there are a lot of tiny parts and while fit is good I think they have over-complicated the construction. 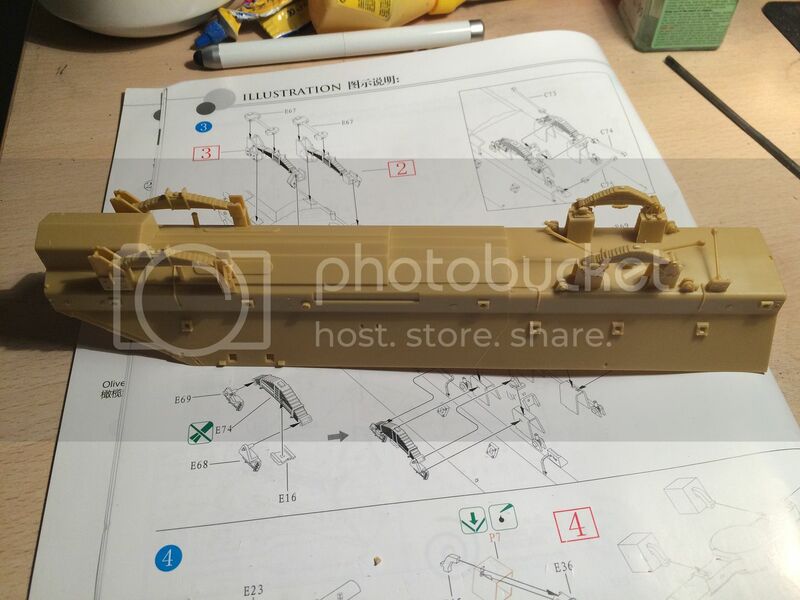 The parts are all nicely molded with no flash and minimal seam lines but there are hundreds of parts....even just cleaning off the sprue joins is going to be a slow, delicate and laborious process. Hey Sean, I'm working on almost the same thing right now too. I got the Buffalo with Space Armor for my birthday last week. I'll post some pics later also. Looks good, Sean. You are really cranking out some great builds. 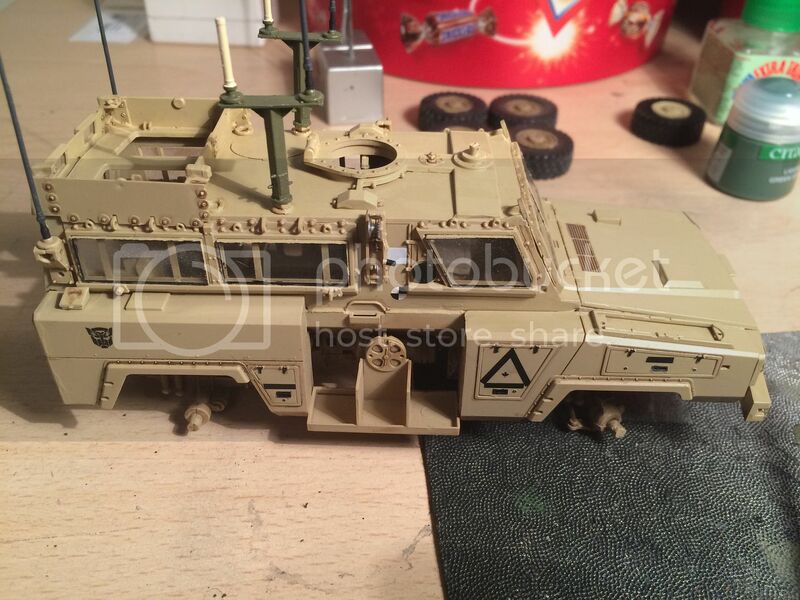 this is my entry for this campaign, my first here on Armorama at all. 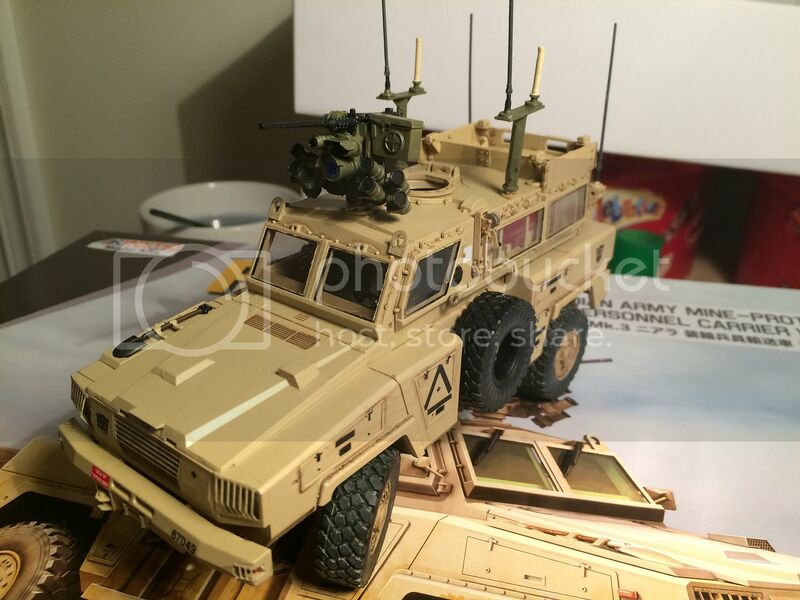 The kit is from Showcase Models Australia, most of you know 'em already. 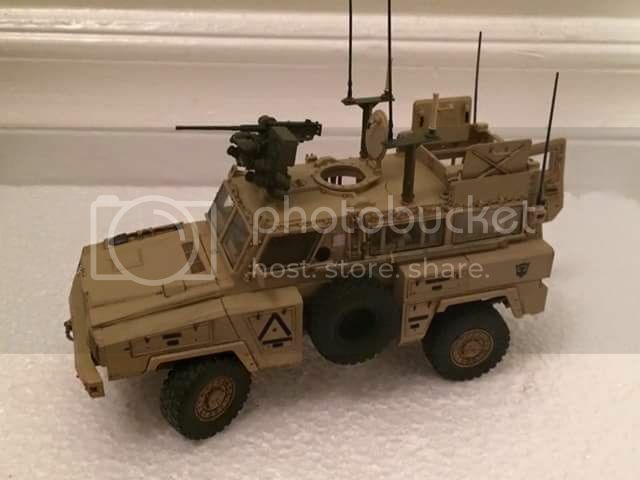 The build will be OOB but with the addition of Blast Models CROWS RWS and DUKE antennas. Here is where I am on my Panda Cougar 4x4. I still have a lot to do on it but work on it might slow down a bit since Sean and I are working on our Buffalo's at the same time. 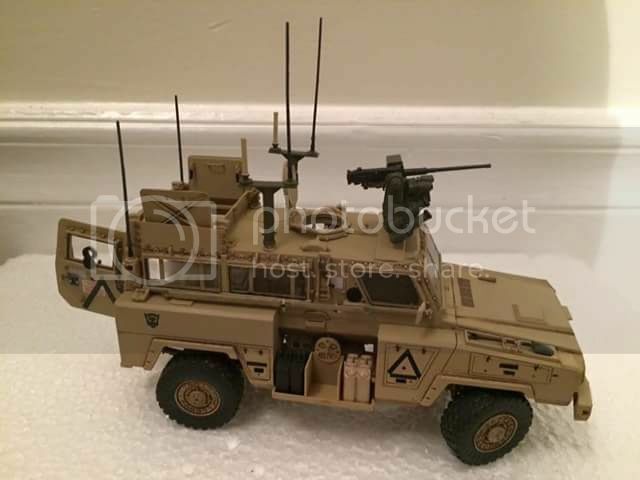 The 1/35 Panda Jerrv has finally been released and I have put my order I so hopefully by the end of the month I can get started.